Econo Cooler: This cooler is to be used where space is an issue. IE. small cars with little interior space or full-size cars where typical heats do not exceed 10-15 minutes. 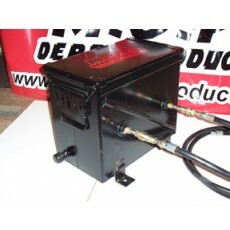 HD or SD Series Coolers: These coolers are to be used in full size cars in heats/features up to 45 minutes. After 45 minutes these coolers will lose their effectiveness due to the fact the water and the fluid will be about the same temp. 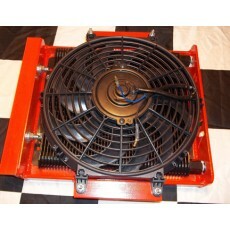 Fan Cooled (cage mount or floor mount): These are a good all around cooler for drivers who use an alternator. I do not recommend electric accessories to be used on cars that are not equipped with a charging system. These will continue to cool even in the longest heats and they do not require bags of ice to be added. Ultra High Performance Fan Cooler: This cooler is the ultimate for transmission cooling. This will cool as long as the engine is running and transmission is working. Only to be used on cars with large interiors. wagons, imperials, old Lincolns. 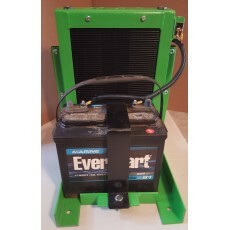 This is the hd floor mount trans cooler with battery mount. Includes cooler as shown, toggle switch and wiring. No battery included. 48 row cooler core .. The newest addition to the M.O.P. Derby Transmission cooling line features a fin and plate type cooler for added durability and maximum cooling. This cooler is hard piped through the side of the cooler box. Mounting legs and drain are included as always. Quick couplers and hoses are available on thi..
New style HD fan coolers feature a long brand fin and plate type cooler for greater durability. this is designed to be mounted to your cage bar. hoses and fittings are available. 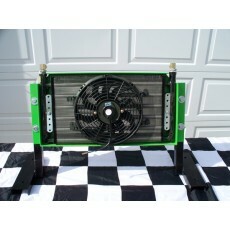 48 row cooler core ..
New style HD fan coolers feature a long brand fin and plate type cooler for greater durability. options include quick couplers, hoses and fittings 48 row cooler core .. This massive fan cooler will keep your transmission cool in the most grueling derby heats. It is equipped with a 12" x 24" hayden cooler core and 12" electric cooling fan. Comes complete with 8’ transmission lines and fittings for gm transmissions. This unit is recommended for use in Imperials..